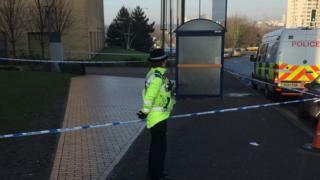 A 17-year-old boy has been arrested on suspicion of assisting an offender in relation to a student who was fatally stabbed outside a college. The 16-year-old victim's life support system was switched off on Friday. He was attacked at about 16:00 GMT on Wednesday outside the Joseph Chamberlain Sixth Form College that he attended in Highgate, Birmingham. Another boy, aged 16, was charged with attempted murder before the victim died and is due in crown court on Monday. He is also accused of two counts of wounding and one charge of possessing an offensive weapon. In addition, police said he had been charged with causing grievous bodily harm and possession of an offensive weapon after a man was stabbed in the wrist in December. An 18-year-old woman arrested on Friday, also on suspicion of assisting an offender, has been bailed pending further inquiries. West Midlands Police remain keen to speak to any potential witnesses. Det Ch Insp Edward Foster said: "We know there were a number of young people in the area at the time and we need them to come forward and tell us what they saw or know. "I appreciate this can sound nerve-wracking but we have various ways for information to be relayed to us, and even the smallest detail could help us establish the circumstances behind this tragic incident."